Greetings from the Rise Up Development Collective, We have some exciting news! In July of 2011 RUDC began the Ghana Clinic Project (GCP). 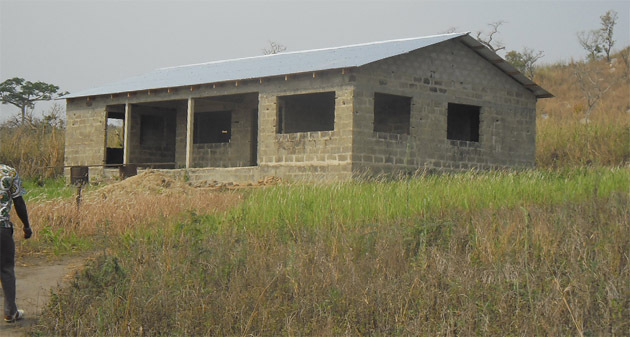 We set a five year time line with the final goal of constructing, stocking, and staffing a sustainable clinic for the isolated community of Wli Todzi, in Eastern Ghana. The only access to Wli Todzi from Ghana is a steep seven mile footpath that winds up the beautiful face of Mount Agumatsa. While the beauty of the hike is overwhelming, community members in need of urgent medical attention must be carried down the mountain by stretcher to Hohoe, to the nearest hospital. This means people in need of urgent medical attention, including women in labor, must wait hours while enduring a painful journey down the steep footpath. RUDC is part of an international effort to prevent further deaths on the footpath during medical emergencies. The Milio family, Vicky Barling, Robin Smalley, UCSC students, and countless other volunteers have been working to raise money to fund the project. In Ghana, Yaw Nutsuga and his family, members of the Wli Todzi community, have been working tirelessly with the Wli Todzi community to acquire materials, a labor force, and documentation for every dollar spent and brick laid. Using organically created international relationships we’ve been able to efficiently use 6,000 US Dollars to complete phase one, pictured above. As ecstatic as we are with the timely progress, we are far from completing our final goal. Phase two is completing the construction of the clinic. We need an additional 6,444 US Dollars to complete the construction. Once complete the Wli Todzi clinic will have plumbing, electricity, and will be ready for stocking and staffing. We are reaching out to the amazing community that has formed around RUDC and the GCP for help with completing the construction. You can make direct donations via paypal or by check. We also encourage anyone interested to contact us or get involved. This project would not be possible without the sincere dedication of it’s volunteers. Thank you to everyone who has helped with the completion of phase one, and we look forward to completing phase two!